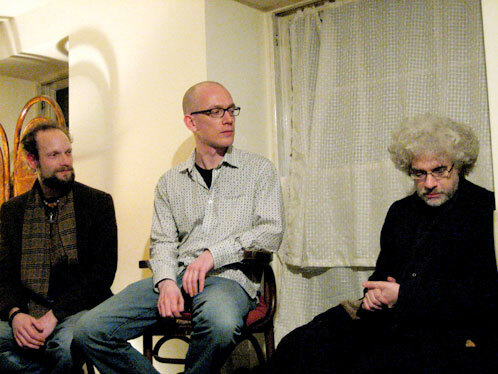 This is the introductory talk Gyrus gave at the official launch event for Archaeologies of Consciousness, at Treadwell’s Books, London, on 29th February 2008. This was followed by a panel discussion with Phil Hine and Robert Wallis. The bulk of these essays were directly inspired by my experience of Ilkley Moor in West Yorkshire. The essays range wide across topics such as evolution, sacrifice, Kundalini experiences, shamanic cosmology, models of history, and psychedelic plants; but really, for me, Ilkley Moor was where it all started. It initiated me into thinking more deeply about the past, and into trying to make my interactions with the landscape an integral part of that thinking. Ilkley Moor is covered in stones that are carved with various patterns, apparently abstract arrangements of lines, cup-marks and concentric rings. These are three thousand or more years old. More recently, the region has accumulated more than its fair share of odd folklore, from black dogs to little green men. It’s a bizarre place that practically urges you to map the strangeness of your present experiences there back onto the layers of weirdness from the past. And that’s what I did. I plunged into studying the moor’s rock art, and eventually the Romano-Celtic goddess of the nearby River Wharfe, called Verbeia, paying close attention at all times to my dreams & synchronicities, and folding the more tantalizing of these back into my research. I performed rituals to ask the moor and Verbeia for help in conducting my research into their histories, and my experience was that this worked—abundantly. Ilkley Moor isn’t just a major inspiration for these writings, it’s also part of why I’ve invited Phil and Robert along tonight. I arrived in Leeds in 1993, shortly after Phil had left for London, and soon became aware of the recently deceased Chaos Magic scene in the area. After I discovered the moors, the kind of ‘urban’ reputation of Chaos Magic left me slightly surprised that Ilkley Moor was one of the chief stomping grounds for Yorkshire’s Chaos Magicians. This was yet another layer of history on the moor for me; this one place, eighty pence on the bus from where I lived, had a millennia-old reputation for attracting cultural oddities which was still alive and kicking. I’ve come to know Phil as having a sound appreciation for in-depth scholarship, alongside in-depth magical experience, so that’s another part of why he’s here, this intermingling of our academic and magical traditions; and this brings me to Robert. I came to realize that my independent research into these prehistoric glyphs happened to be running alongside a new current in rock art research in academia—one which holds that these patterns and forms, from the cup-and-ring art that’s found across northwest Europe to the painted caves of southern France or Africa, may have been derived from visions seen in altered states of consciousness. Specifically, the apparently abstract Ilkley-style art has been associated with the so-called ‘entoptic’ phenomena seen during early stages of trance—lines, grids, dots and vortices, all taken to be hard-wired into the optic nerve in some way. Perhaps the earliest landmark paper in this current, published in 1989, is ‘The Signs of All Times’, by two South African archaeologists, David Lewis-Williams and Thomas Dowson. David Lewis-Williams has since pushed this theory forward, popularizing it in his books The Mind in the Cave and Inside the Neolithic Mind. Thomas Dowson went on to run a now-defunct MA in rock art at Southampton University. I had a friend there doing archaeology, and Thomas was her tutor. When he mentioned he was taking his MA students on a field trip to Ilkley Moor, she put him in touch with me. Along with a fellow independent obsessive in Yorkshire called Paul Bennett, I thus became a kind of wayward local guide to the moor for Thomas and his students—one of whom was Robert. Robert’s also a practicing pagan—author of a book on Norse magic alongside his many academic works. Now, I’ve lost track of the academic debate since the late ’90s. I’ve just recently been catching up with it thanks to Robert. And I’m at once heartened and disappointed. It’s heartening that things seem to be moving along, from an entrenched, long-fought squabble over the ‘neuropsychological shamanic trance hypothesis’, to a wider debate about the general mindset of prehistoric people. Animism has gone through a revival and re-thinking in anthropology of late, and this seems to be slowing seeping through to archaeology. It’s disappointing, of course, that it’s taking so long. My reliance on obsession wasn’t a sustainable course for research; but within a few years I hit on basic shifts in envisioning the world that have taken some top academics decades to appreciate. There’s a lot of ideas in my essays here that I wouldn’t stand up and defend now; but looking back, it seems to me that my willingness to make my personal experience of magic and altered states filter my reading of archaeology and anthropology greatly enhanced my ability to tap closer into the mindset of the cultures who created these intriguing artefacts. I have more of an appreciation now for academic research, for the value of developing our own traditions of thinking instead of just trading them in for some kind of cod approximation of animism or shamanism. But still I wonder: might we need to sacrifice a good part of our traditions in order to develop them? If these neurobiologists are correct, … the fundamental dichotomy in human behaviour and experience—rational and non-rational beliefs and action—will not go away in the foreseeable future. … We are still a species in transition. It seems clear that he envisions our species as progressing along a linear path from immersion in ‘irrational’ religion, slowly stepping out into the light of rationality. not an overwhelming by, but detachment from the instinctual sources of vitality; not immersion in the sensory surround but disengagement from a derealized external world; not stuporous waning of awareness but hypertrophy of consciousness and the conceptual life. … a matter of the mind’s perverse triumph over the body, the emotions, and the external world. I wonder if the protracted stand-offs in academia, such as the debate in rock art over the past decade or so, also demonstrate ‘reason gone mad’. Perhaps a fuller, more sensitive embrace of the evidence of embodied experience offers a way forward, not back, out of these labyrinths of the mind.